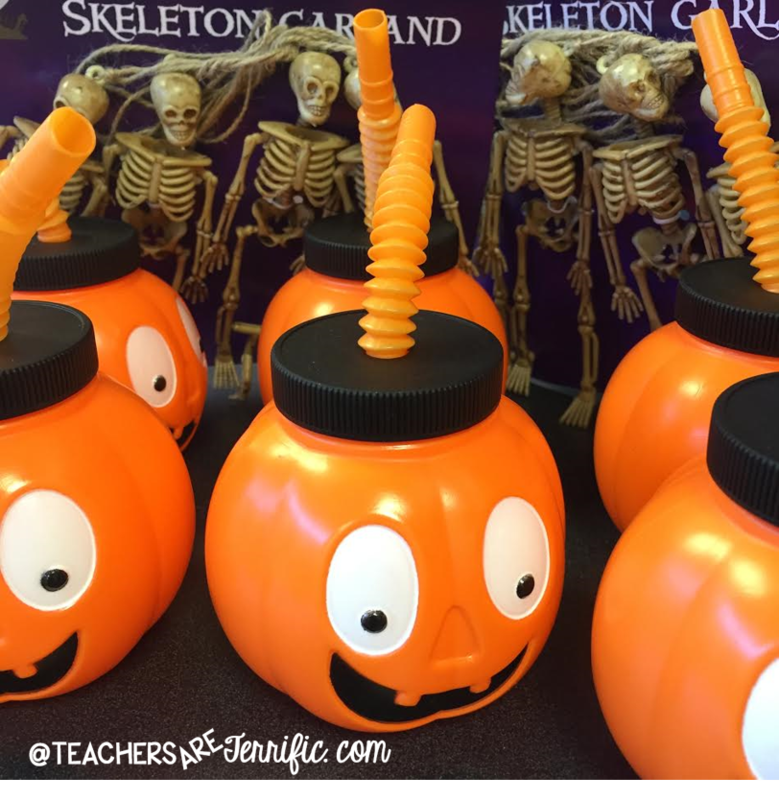 3 Ways to Spook Your Students at Halloween- with STEM! Just in time for the spooky month of October! 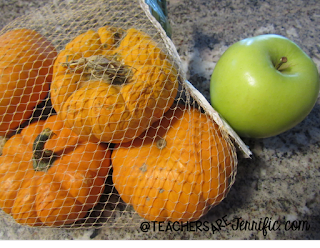 I started a seasonal series of STEM challenges back in January, which seems so long ago. We have had a blast creating and testing these- especially with this latest trio of October fun! So, here's an update on this trio that is now complete! We watched a really quick video about Punkin' Chunkin' and then designed our own. I did discover that the paper cup was a perfect flexible material that the little catapulting systems needed. The tiny pumpkins are candy from the dollar store! Next, how about Haunted House Mazes! I have built several different versions of mazes with STEM lab kids, but this one turned out to be a favorite. I think it had something to do with all those creepy crawly bugs and plastic skeletons! Take a look above at the plastic roach.... it just looks way too real, which made these mazes really fun! We used a ton of white glue and then had a blast trading mazes and making them work! 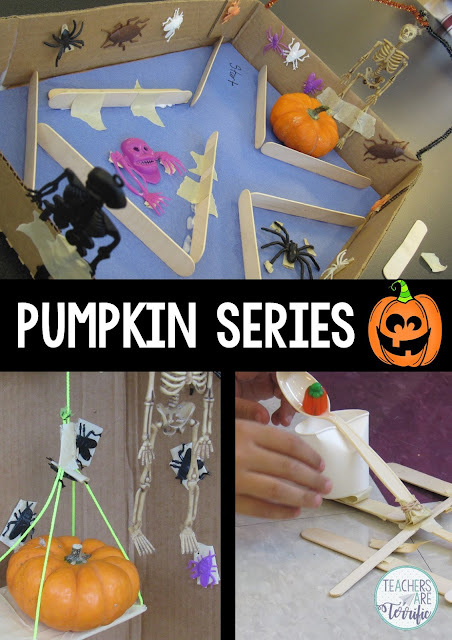 Finally, it's one we loved- Pumpkin Elevators! I had a vision about this one and wanted to have kids use a box and make an elevator. The box turned out to be in the way so we cut them in half. That still gave us a place to create the elevator and it worked great! The first test class had no constraints on how to make the elevator work and they made theirs very quickly so for the next classes I made the rules tougher. They had to have a working crank! With a handle! We tried fake and real pumpkins and loved making these! Exactly what are fake pumpkins? I know-- they are seriously cute! This is what we started with in our pumpkin events! I wanted miniature real pumpkins, however, the stores did not have these yet. So, I trekked off to the dollar store and found those plastic drink bottles. They didn't weigh enough so I filled them about halfway with sand. I also took the straws out and double taped the holes. In the background of that photo, you can see a skeleton garland that was also a spectacular decorating item. Here's another idea: When I taught third grade our students had a unit on the skeletal system and we learned the names of about 25 common bones. I had sets of those plastic skeletons that the kids used to practice their bones! Anyway, after we started working on this challenge I found the tiny pumpkins I wanted! So, these are just for Halloween and the month of October, but could they be adapted to other times of the year? Absolutely! Use apples instead of pumpkins in the launchers. In the elevators lift an elf at Christmas time. Decorate the maze for Valentine's Day! Endless possibilities! Have fun! OMG I loved your STEM activities. The haunted mazes were the best although I bet the pumpkin launchers were a hit with the kids. Great ideas thanks for sharing. My 5th graders would love to make the mazes. Thanks for sharing. Thanks so much for visiting! I posted these three challenges in my Teachers Pay Teachers store about a week ago! All of these were great fun! The mazes are still being tried by other classes that come in the lab! Thanks for stopping by! All of these activities look amazing! I might have to use one of these on Halloween. Thanks for sharing! My test classes had a ball with these. The other classes can't wait to have their turn! Thanks for visiting!